Numbers from the U.N. predict that 10% of the world will be on the Internet this year. Growth is fastest in Asia and Africa. This is a volcanic erruption on Jupiter's moon Io, spewing lava several kilometers into the sky. Apparently the biggest ever erruption recorded in our solar system. I don't know why it is news now, because it seems like it was last year. There are many fun games that techies play with the Google search engine. One self-absorbed game suggested by Steven Johnson, author of the book Emergence is to use Google to see what mind-share you personally appear to have in a certain subject. Like, when he looks up "emergence" he sees 1,450,000 hits, and if he looks up "emergence" together with his name, he sees 5190 hits, which means he has 0.3% mindshare on that word. Well, I can't resist playing that a little bit, being a slight bit self-absorbed. I can't find any one-word words I have much mindshare in. But, hey, if we say "New Civilization" I have 4.1%, which beats out Gorbachev at 1.7%, but not (Alvin and Heidi) Toffler, who have 6.5%. Those guys have all written books with "New Civilization" in the title, in case you didn't know. And I got 3.2% on "World Transformation". Hm, and 0.006% of "wacko". 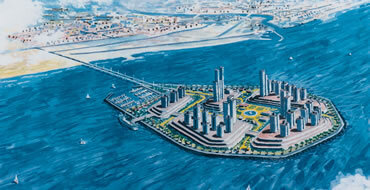 Builders are planning cities on several artificial islands off of Israel's Mediterranan coast. There are some environmental pros and cons, and divided opinions about whether it makes economic sense. Communities of Value form between people who have a common interest in value. It is mostly used about groups where consumers / customers / regular people are networking with each other concerning a certain type of product or service, or a certain brand. Oldfashioned companies HATE that people are sharing notes about themselves, because they want to just talk TO people without interference. Translation: companies that want to lie to people will try to sabotage any attempt of those people talking amongst themselves. What's new is that those companies will go out of business, unless they change and learn to thrive on the free networking and self-organization amongst the people they serve. eBay has made it huge by facilitating Communities of Value. Napster was a great Community of Value, but the music industry didn't recognize it, to their own loss. Open Source software is often coordinated through Communities of Value, where both programmers and end-users participate. Linux is a great example, or PHP or MySQL. Communities of Value form by themselves all over the place, wherever online forums are easily available, and regardless of whether any related companies participate or not. Communities of Value might also form amongst businesses that have similar economic interests, or that might find synergetic relationships amongst each other. Community is the best Commercial, Reshaping the Landscape, Backroads.